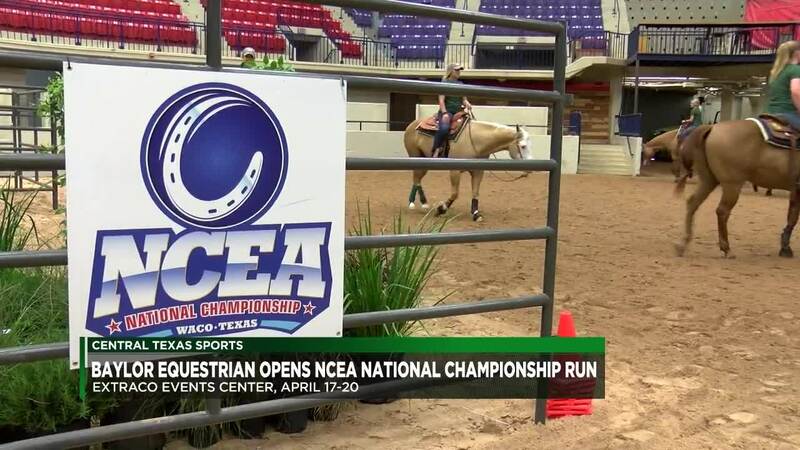 WACO, TX — Hosting at the Extraco Events Center in partnership with the City of Waco and McLennan County for the 13th-straight season, the Baylor equestrian squad is set to take part in the 2019 NCEA Championship, running Wednesday through Saturday. The tournament format takes place over four days, with the team bracket featuring the nation’s top eight teams in competition for recognition as the NCEA National Champion. There are also four event-specific brackets (fences, flat, horsemanship, reining), featuring up to 16 teams competing for one of four titles as NCEA Event National Champions. The highest combined point totals in the events competitions by discipline (hunter seat, western) will be awarded recognition as one of two NCEA Discipline National Champions. BU will kick off its tournament run in the events brackets on Wednesday with the opening round in two events. Baylor leads off with fences as the No. 11 seed, facing No. 6 Oklahoma State, and in horsemanship as the No. 6 seed vs. No. 11 South Dakota State. Fences is set for an 8:30 a.m. start while horsemanship will begin at 2:30 p.m.
Baylor (9-4) enters the team competition as the No. 3 overall seed, paired with No. 6 Georgia to open play on Thursday at 8:30 a.m. A win over the Bulldogs would land the Bears into the semifinal round, taking place later that afternoon at approximately 4 p.m. The quarterfinals and semifinals of the event brackets will take place on Friday starting at 8:30 a.m. The top-seeded BU reining team will take on the South Carolina/TCU winner at 8:30 a.m. before the No. 2 Baylor flat squad takes on the South Carolina/Fresno State winner at 1:30 p.m. to close the third day of competition. The three days of competition leads into the Canadian Pacific NCEA Championship Saturday, with the team and all four event championship finals concluding on Saturday. The team title matchup kicks off at 8:30 a.m. with the event titles later that afternoon in the order of fences and horsemanship at 2 p.m., followed by reining and flat at 3:30 p.m. Admission to all days is free to the public. Fans who can't make it to Waco for the NCEA Championship can follow online at the tournament central page, which includes results, live scoring, and live-stream links: www.baylorbears.com/ncea [baylorbears.com] . EQSportsNet will live stream the championship.